Major League 2, located on Vedder Rd & Gaetz St (45768 Gaetz St. just behind Frankie’s) is an excellent place to try out one of 23 craft beers, get some of the best wings in town or try one of their infamous in-house pizzas. With daily specials and happy hour every day from 3-5pm, it’s the best place to visit in town. When we asked people where they would recommend to eat in Chilliwack, the name ‘Curly Kale’ kept coming up time after time. Located near Garrison Crossing (5669 Vedder Road - see map below), the Curly Kale is what looks like a quaint little greasy spoon cafe, but it goes beyond much more than that. Featuring locally produced and seasonally grown products, the Curly Kale Eatery’s menu has something new for you to enjoy every few months. Some exciting news too, starting April 26th the Curly Kale kitchen will be open until 8pm on Fridays and Saturdays. It’s dinner time at the Curly Kale!!! Although we didn’t get a chance to check out their Magpie’s Bakery, they offer fresh baked breads and treats. That’s something that we will just have to head back and try next time, which will be some time soon. Located on the corner of Princess and Young (see the map below), TacoQue Eatery has the feel and swagger of a hipster joint from the big city. The service is friendly and the menu has plenty of mouth-watering options. Whether it be a sandwich or a taco, the highlight of this small eatery has to be the smoked meat. Brisket, pulled pork, smoked chicken or turkey; it’s the perfect place in Chilliwack to get a little taste of southern Texas BBQ. On our inaugural visit, we ordered the brisket sandwich and pulled pork tacos and quickly discovered their homemade potato chips… And as you may remember, we have a thing for delicious potato chips. Paired with our brisket sandwich, the chips were freshly made and impossible to stop at just one. 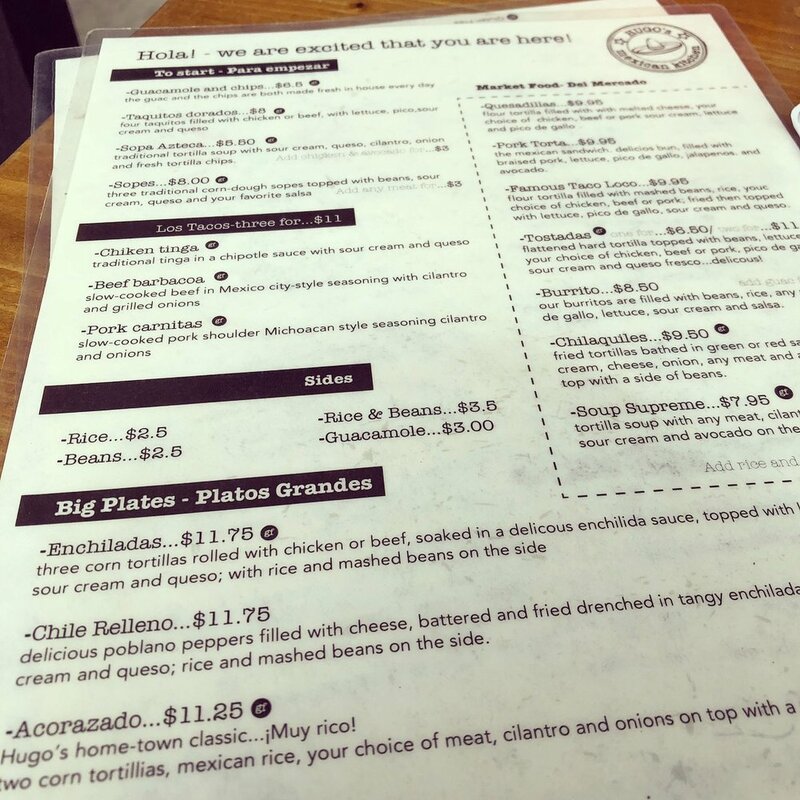 TacoQue in Chilliwack is sure to be a hit and is the perfect place for lunch to-go or to stop in for a quick bite. 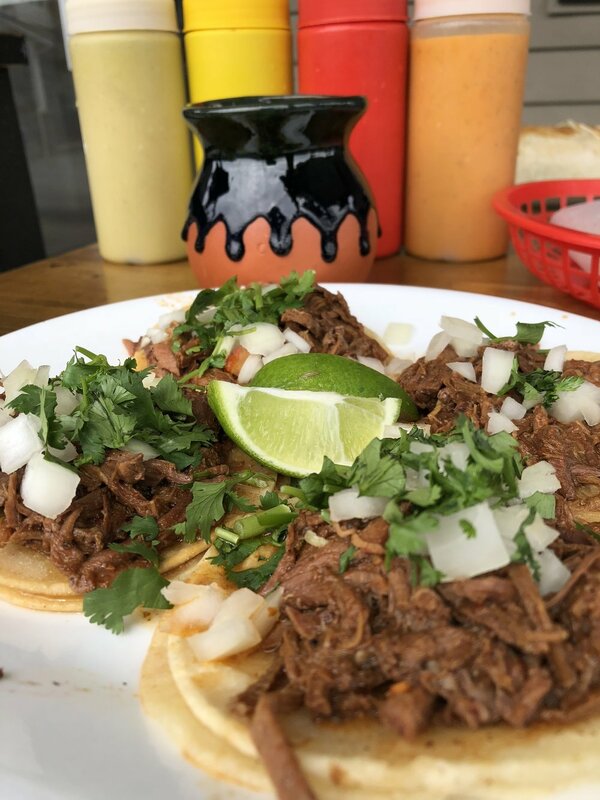 With the head chef having already made a big hit in Chilliwack with the Doughnut Hole, TacoQue prides itself on fresh ingredients and uses as many local products as possible. And speaking of doughnuts, the Doughnut Hole has officially set-up shop right next door and offers their now-famous doughnuts with fresh coffee! Delicious authentic pasta, extensive wine list and trendy restaurant all in one?! Yes please!!!! Though recently relocated, Frankie’s Italian Kitchen and Bar is still one of the best places in Chilliwack to pair Italian cuisine with a fine wine. On one of our first visits to the restaurant, we enjoyed the house red wine, some appetizers (the spinach dip is to die for!) and traditional spaghetti & meatballs. We also tried some gnocchi with chicken and pesto. It was all delicious and beautifully plated. Located on Vedder Rd, just south of Knight Road, (map located below) the restaurant has two sections where you can have your choice of sitting either on the bar side or the dining side of the restaurant. Whether it’s to impress your date or have a business lunch meeting, we highly recommend the delicious and fresh Italian menu at Frankie’s. A place where beach club meets mountain lodge, the style of Lakeside Beach Club restaurant has captured the heart of what Cultus Lake is to us. Whether visitors are in the area for a quick winter’s walk, or visit during the summer season where the district truly becomes alive with lake activities, waterslides, camping, hiking and amusement parks, the Club is located in the hub of it all, right off the main Cultus Lake intersection. Located at 4131 Columbia Valley Road (map below) in Cultus Lake, Lakeside Beach Club offers a unique food menu with a small but carefully selected drink menu. Their charming patio offers great summer dining while their ginormous fire place provides a warm, winter retreat inside. This family-friendly restaurant prides itself on high quality, fresh ingredients and custom cocktails. The service is friendly, the space inviting, and private event space is also offered for larger events or parties. The Cultivate Cafe is a new restaurant/cafe located directly next door to Minter Country Gardens on Fairfield Island (map below). Whether bringing a laptop along to get some work done or meeting a friend for lunch, the newly renovated café with its crisp, simplistic lines creates a calm atmosphere that invites you to linger. 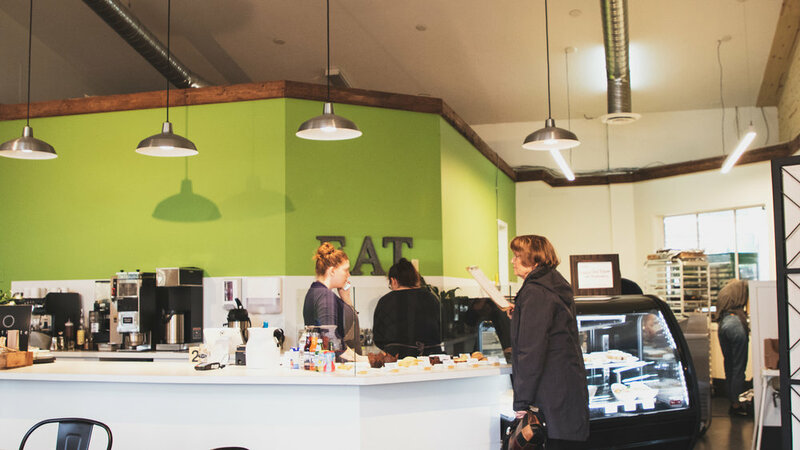 You can meander on in for a delicious sandwich and hot coffee after browsing through Minter Country Garden, or, enter in from the parking lot to enjoy a cold beer or wine with some tasty sides or a dessert. This freshly expanded space made for an excellent stop on a stormy Friday afternoon. Their menu is straight forward and enticing. Handmade products range from their desserts and potato salad to the chutney they put on their Turkey & Gouda sandwich. Being a big fan of sandwiches, I enjoyed the Tuscan Ham & Cheese sandwich, but the Turkey & Gouda was my personal favourite. Full of character and deliciousness, I found myself wanting to steal the rest of the sandwich for myself. The owners have ditched the classic green garnish from the plate and replaced it with delightful waffle-style potato chips – adding just the right amount of crunch and saltiness that left you wanting more, but completely satisfied at the same time. We also tried the daily soup, which was a Roast Red Pepper soup, and the pasta salad. The soup was perfect for the stormy day and played a nice addition to the sandwich. We enjoyed the menu variation, which lets you pick exactly what you would like for meal; so if you want a simple bowl of soup and carrot cake for dinner, you can have it. When warm weather visits, there is a cute little patio waiting for you to relax on with a cold beverage and good book while you enjoy the sights of summer. Cultivate Cafe also has a private side room available for bookings, perfect for large groups, functions or private parties. Major League 2 is 75% complete the renovations they started back in the early summer. Part of those additions include more patio space, a new wing/expansion with extended bar, additional tables & seating, a few special surprises and of course brand new furniture (which came in this week). Major League 2 is THE place to go for some of the best daily specials and happy hour deals in Chilliwack - sleeves of beer | 1oz highballs | 5oz glasses of wine PLUS get half off wings during happy hour! Check out the 360 degree photo below. 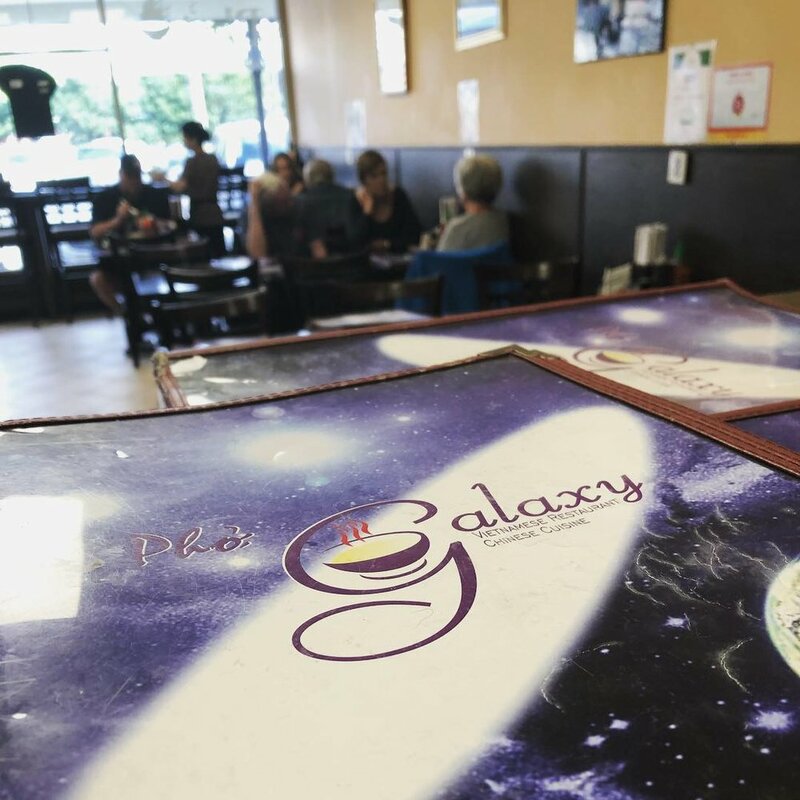 With fall already making its show in a splash of colour, and winter quickly approaching, Pho Galaxy Restaurant is the perfect place to warm up and enjoy a hot, delicious meal. 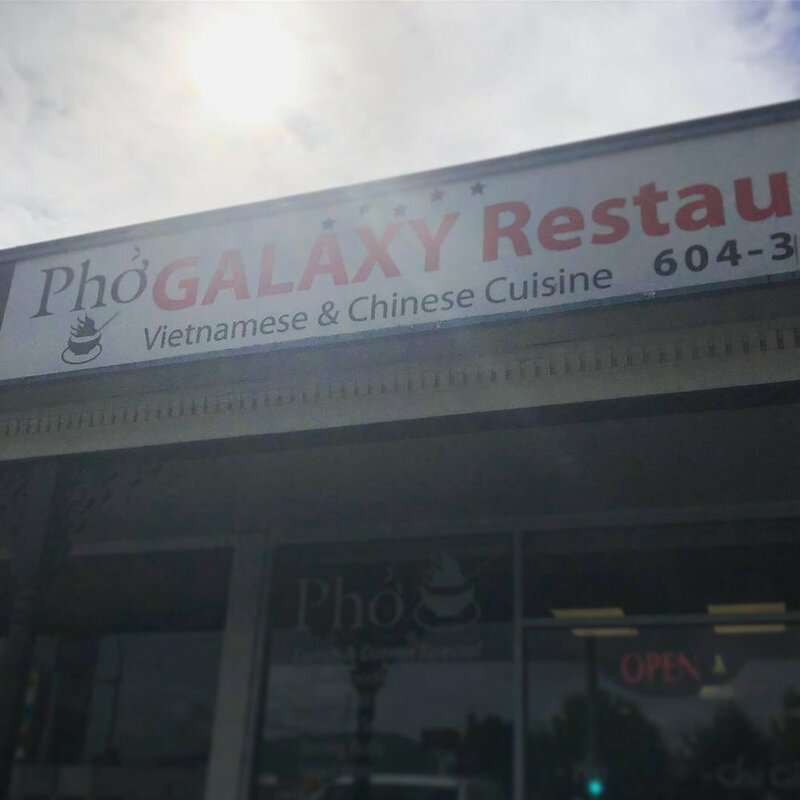 Their menu has a wide selection of pho (dictionary definition of pho: a type of Vietnamese soup, typically made from beef stock and spices to which noodles and thinly sliced beef or chicken are added), alongside other variations and menu items that can please anyone’s lunch desires. Whether we order in or take-out, as much as we love a steaming bowl of pho catered to our own preferences with its wide assortment of seasoning, noodle, vegetable and meat options, one of our personal favourite items on the menu is the salad roll, which, when broken down, is just an excuse we use to enjoy the delicious peanut sauce that accompanies it. Located at 45863 Yale Rd (on the corner of Yale & Wolfe - map below), it can be a tight fit to find parking BUT there is parking available just 1/2 a block away on the corner of School & Wolfe Rd. If you haven’t heard about the latest craze in doughnuts in Chilliwack, chances are you’re living under a rock. The Doughnut Hole, located in the lobby of the Royal Hotel in Downtown Chilliwack, at the end of the way section of Wellington (map below), is putting out some of the most amazing HANDMADE doughnuts you will ever try. Their menu changes weekly and their inventory gets swallowed up quickly, literally. It’s hard to find a doughnut 30 minutes after they’ve open for the day. Their menu includes everything from Key Lime Pie to Salted Caramel 'n Pork Belly and Hedgehog doughnuts. With their growing popularity, Doughnut Hole has expanded their availability by bringing donuts to Produce Gone Wild for special occasions and Hofstede’s Country Barn for regular deliveries Tuesday - Saturday. Aside from these amazingly tasty handmade doughnuts, Chef Darcy (head chef for the Royal Cafe & Wellington Social House) is particular about using as many local products in his doughnuts as possible. You can pickup doughnuts Tuesday to Saturday from 8am - 2pm, but we highly suggest you get there at opening time because they sell out just about every day. If you're anything like us, you love a night of good sushi. Throw in some hot sake and spicy tuna rolls and we're having a great time. Yale Sushi, located in the Southgate Shopping Mall on Yale & Hodgins (map below), is a wonderful little sushi restaurant that is great to stop in and enjoy your meal; OR call ahead and pick up some take-out. For our recent night with family we shared one of their party trays and added a couple little things for people's special diets and there was more than enough to go around. Personal highlights would have been the Dragon Roll (spicy tuna) and the Yam Tempura. Have you been to Yale Sushi? Do you have a favourite dish there? We are fans of Old Yale Brewing and LOVE the Wednesday Cask Days. Every Wednesday at 2pm, OYB taps a one-off cask that is usually experimental and based off one of their main beers. This week it was the West Coast IPA with mint, lime and white rum. Really tasty! A lot of times the cask will be something based on the season or an upcoming event and is always worth the stop in on a Wednesday to try it out. Go enjoy a fresh, new beer! You'll be glad you did! We kept getting the recommendation to go and check out The Wellington Local House. To say we enjoyed it and wished we could have tried more on their menu, is an understatement. Stopping in for a mid-week lunch was great. It was quiet, the door open and downtown shopping available steps away. We enjoyed some delicious Steamworks Craft Beer on tap with an amazing appetizer of potato skins and a Butchers Salad to share (see below). Follow The Wellington Local House on Facebook! Father's Day around here involves a new tradition. After spending the day with the kids playing baseball, video and board games, the meat party gets started. 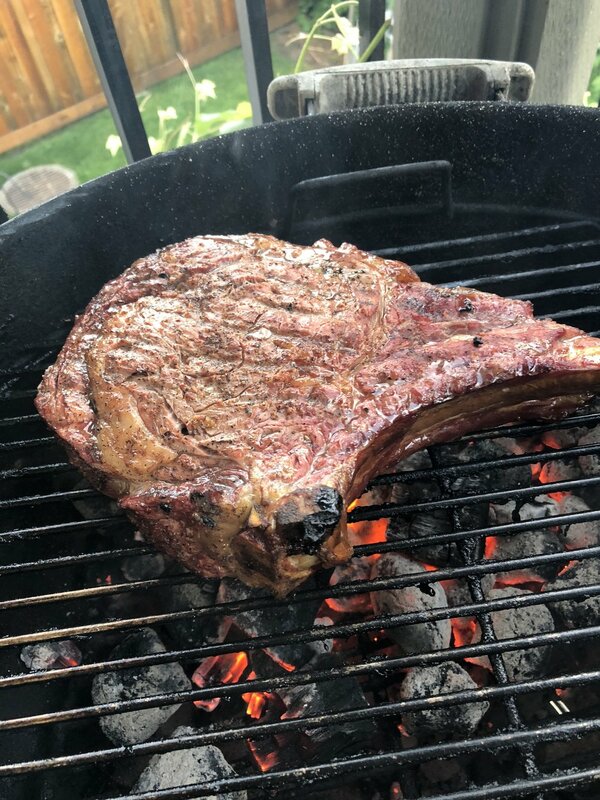 Kids get tucked in bed just as the lump charcoal gets lit and the tomahawk steak from Fraser Valley Meats is sitting on the counter waiting for some basic seasoning. 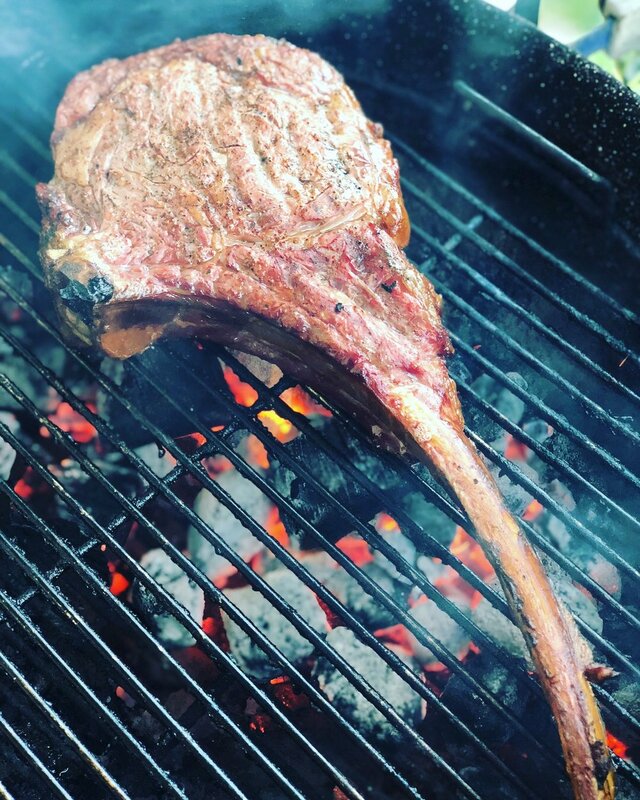 The Tomahawk Steak is just a cool piece of meat. It's not some out of this world cut of beef; don't get me wrong, it's damn tasty but it's nothing out of the ordinary except for the the large bone left on. Seasoned with SPG (salt, pepper and a bit of garlic) you let the beef taste run free when you're done. 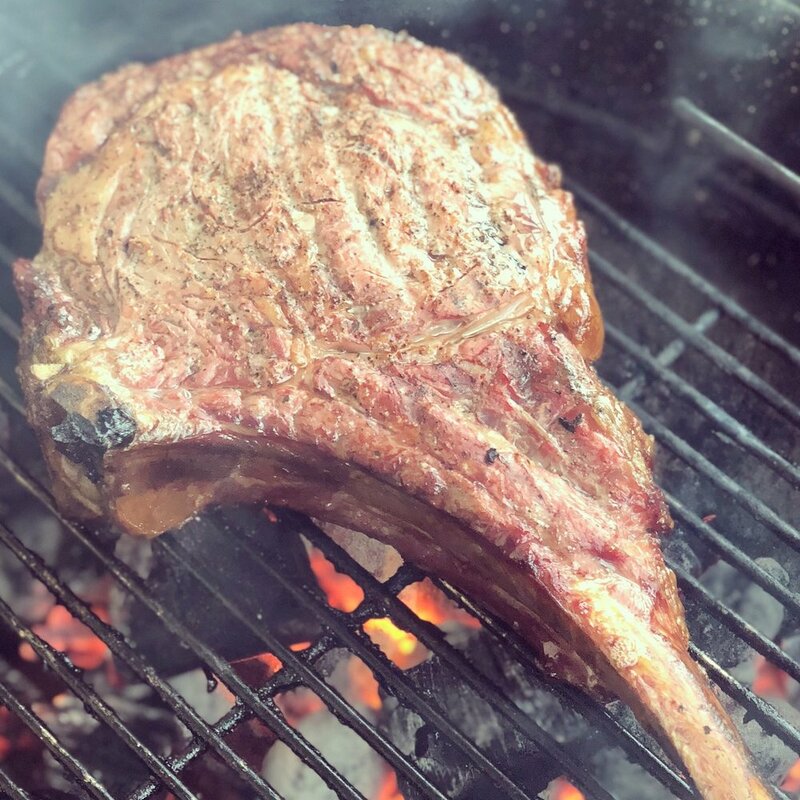 Personally, reverse sear is the way to go with beef. Cook the steak to 120-130 degrees and then get your coals nice and hot. Slap that steak on top of those hot coals and get some flames rolling. Deliciousness ensues. 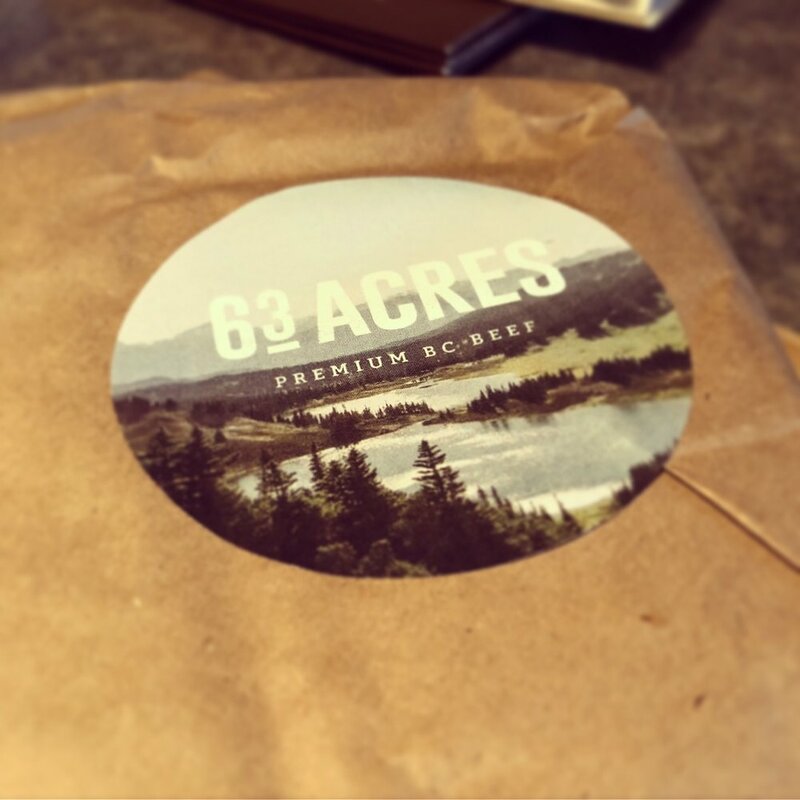 I've had 63 Acres beef from Fraser Valley Meats a few times now and I've been more than happy with it. It's true what they say, you get what you pay for. Enjoy! PS - Fraser Valley Meats is undergoing a big construction project and it's pretty exciting to check out! 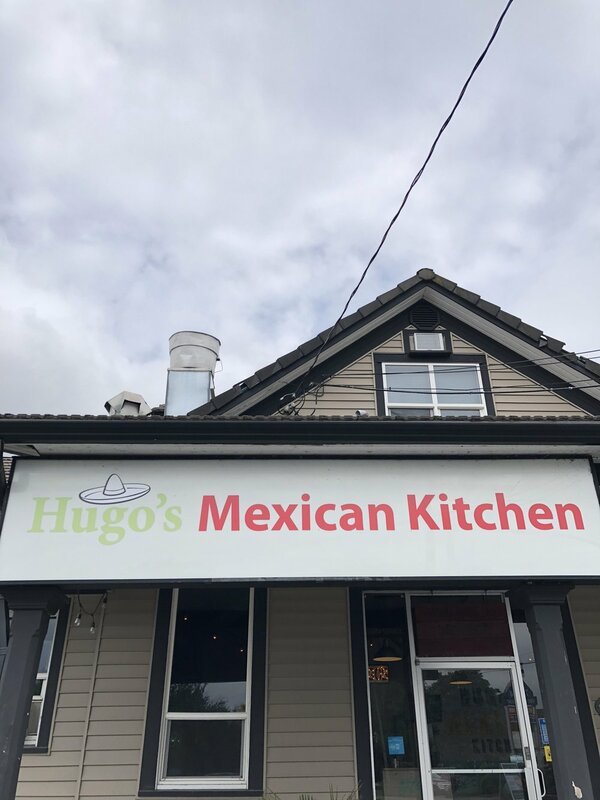 Hugo's Mexican Kitchen is a must stop for anyone in Chilliwack. Have some amazing Mexican cuisine with no passport needed! We tried the Beef Barbacoa Tacos & the Chicken Tinga. Both delicious. We've previously gone with kids in tow and the Cheese Quesadilla with rice and beans is a big hit. And don't forget the churros... to die for! 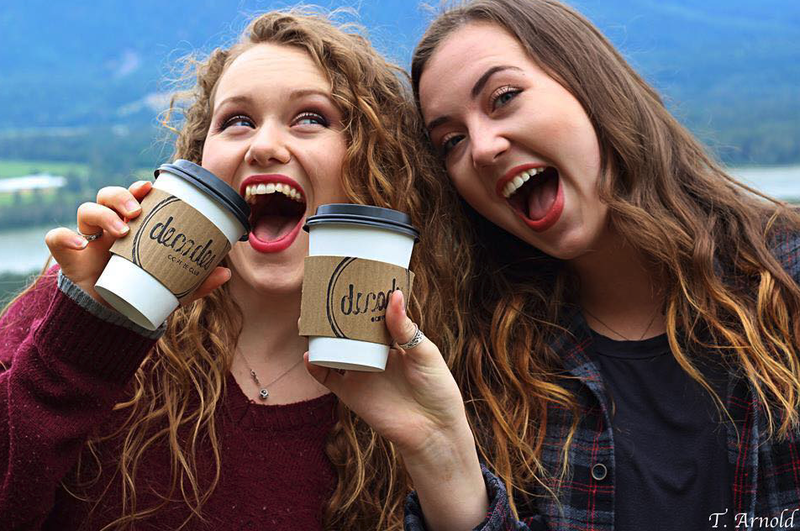 What many consider to be a fixture of downtown Chilliwack, Decades Coffee Club is a must stop for your caffeine fix and sweet tooth cravings. 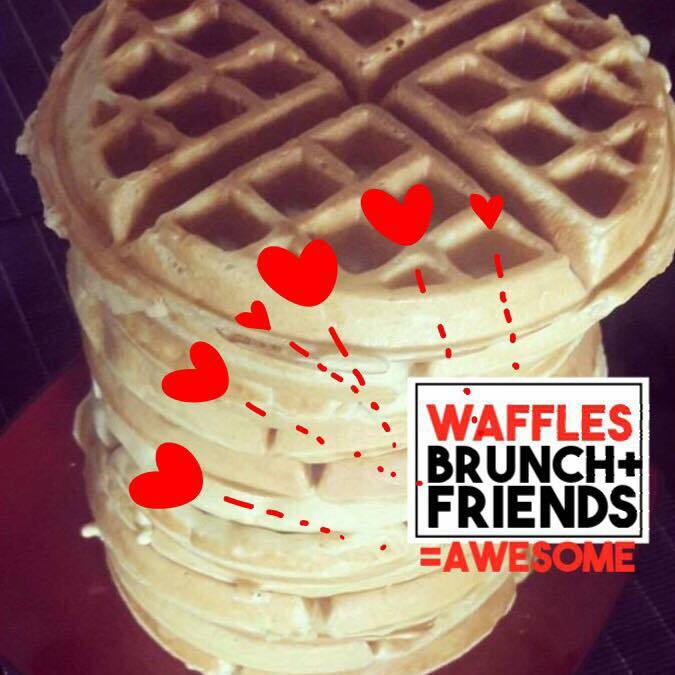 Often voted as the best place to get dessert in town, Decades also offers various breakfast and lunch options. They even cater too. Ron Laser, owner, envisions Decades Coffee Club as a gathering place for good food and memories. 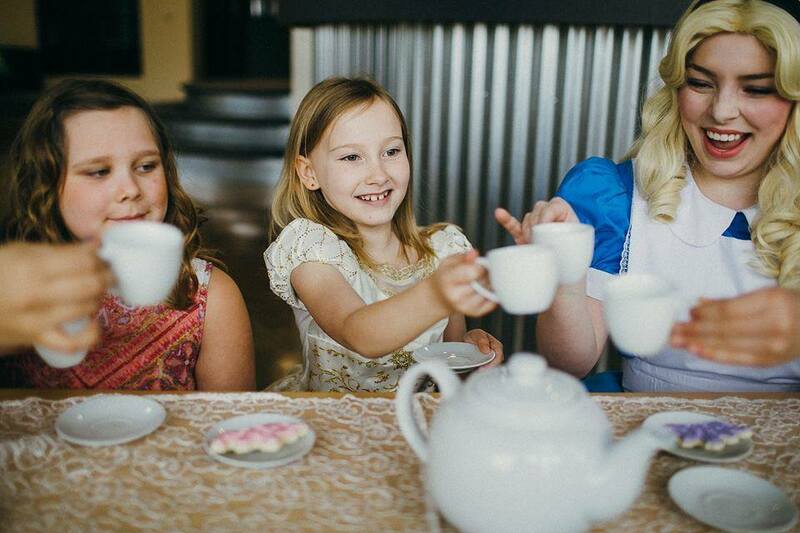 Hosting events like 'Waffles with Friends', tea parties with Princesses and partnering with various creative people in our community; Decades sets itself apart from other coffee shops and is a must stop in and relax kind-a-place. "I remember times around the kitchen table enjoying the company of others in laughter and tears and I wanted it to last forever. Decades Coffee Club is here to bring back those times for everyone. 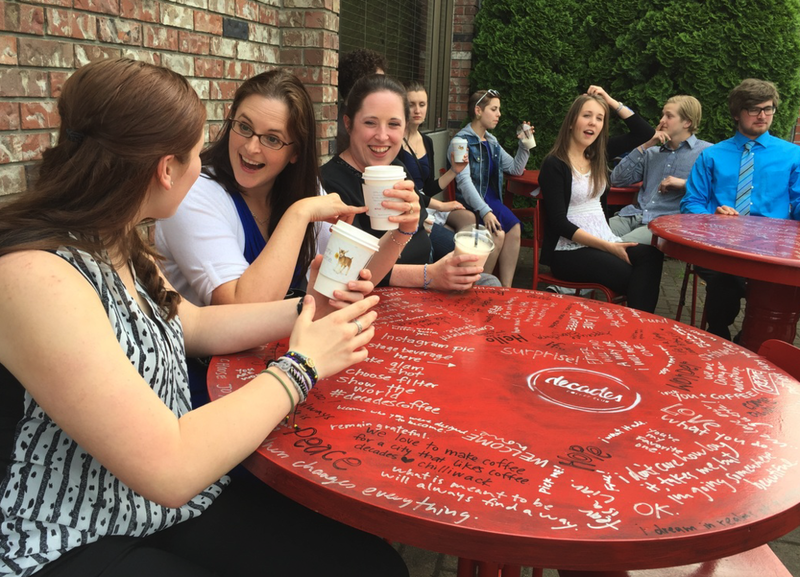 At Decades Coffee Club we bring back the social atmosphere created by great friends, food, coffee and our baristas." Baker & Co. Gourmet Food Truck is now closed. We recently went to try out the new food truck, located at the NEW Vedder Park close to the Vedder Bridge and UFV Campus (check the map below to see where to find the park and food truck). The Baker Gourmet Food Truck is located right next to the ample parking lot and even has a couple of large tents with tables and chairs. We ordered three things: Neets Nuggets (chicken fingers), a Flat Top Dog (with everything on it) and some Better Baker Bacon Cheese Fries. It was delicious and we had leftovers to take home. It's a great place to end up after a walk down the Rotary Trail or a morning of fishing on the river. Bring your dog or kid for a play in the park and then enjoy an amazing food truck feast. With a debit machine on hand, you don't even need to have cash to bring along. "Baker & Co. Gourmet foods Inc. is built on more then 40 years combined experience in the Hospitality industry. The Husband and Wife Combo of Chef Jay Baker and Nita Vallillee, bring decades of love and passion for People and Food. We Stand For Something Great in everything we do. 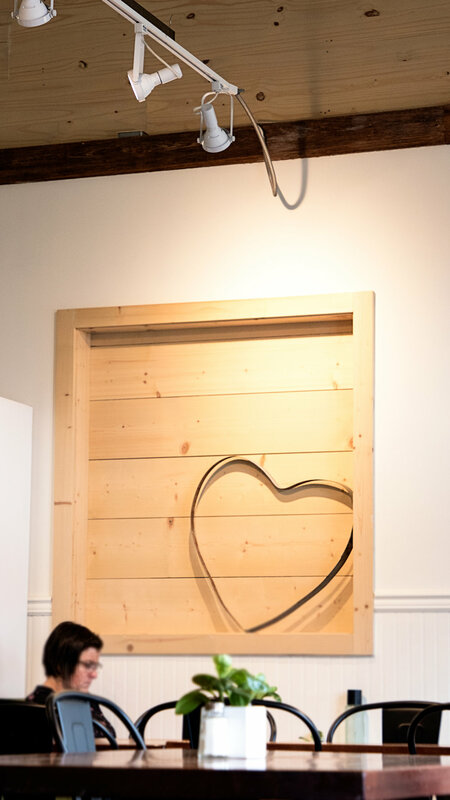 That means carefully sourced premium ingredients from like-minded purveyors we admire and love; thoughtful, well-crafted and responsible design for its place; and deep community support through donations, events and volunteering. Thanks for standing with us!" Chilliwack has plenty of options for take out food, but one of our favourites has to be Shandhar Hut. Located on Young Rd, between Chilliwack Central and the train tracks, Shandhar Hut has amazing options for everyone in your family. Vegetarian or Gluten Free people to feed? They've got you covered no problem. The Butter Chicken and rice is a classic and you can never order enough Naan Bread! Major League 2 is a great place to find quality food, refreshing domestic, imported and local craft beer, and a perfect atmosphere. The Craft Taps menu is always changing. Be sure to check it often for some new craft beer choices. Old Yale Brewing Cask & Tasting Room Visit If you haven't had the chance, be sure to visit Old Yale Brewing every Wednesday to try out their new cask beer they feature each week. This week it was a Vanilla Whiskey Stout and it tasted amazing.